VMware NSX 6.2 introduced Cross-vCenter including Universal objects like Universal Transport Zone, Universal Logical (Distributed) Router (UDLR), Universal Logical Switch. So what happens if you’re on 6.2+ and you can’t create those objects? Can’t create Universal Transport Zone. Can’t create Universal Logical rRouter. Can’t create Universal Logical Switch. 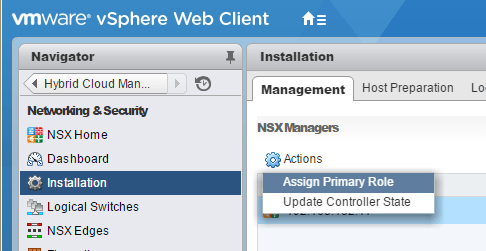 Assign Primary Role to the main NSX Manager. 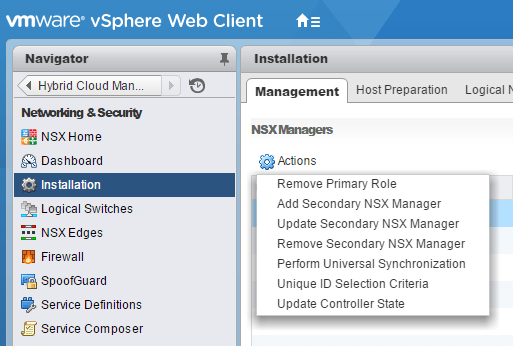 This will enable the creation of universal objects and enable more options for NSX managers including “Perform Universal Synchronization”. This entry was posted in Network, NSX, Virtualization, VMware and tagged NSX, universal, vmware. Bookmark the permalink.